Welcome to the first ever Product Hunt Round-Up by Jared Goodman Inc. Everyone knows Iâ€™m obsessed with reading up and testing out the newest and coolest tech products being built by brilliant founders all over the world, and Product Hunt is the place to do it! Each month, Iâ€™ll be tracking down the top ten products upvoted, the biggest announcements, and of course, my personal favourites! Have a product you hunted on PH and want it featured in the next monthly round up? Send me an email at jared@jaredgoodman.ca ! For now, strap in and test some of these puppies out! SOLO helps freelancers get organized, get paid & get moving by combining multiple different areas of administrative work in one simple and easy to use application. As a freelancer myself, I personally canâ€™t WAIT for this app to be available in Canada. Track your time, and get paid for it easier and faster! OKAY, this is flipping cool you guys. Bliss lets you fly now and pay later. What does that mean? You get to book your flight and then pay it down after your trip! Iâ€™m super excited to follow this startup's success and growth as they move further along, but right now theyâ€™re one of the hottest products hunted on Product hunt with a waitlist of over nine thousand (Iâ€™m 9139). Could be huge for students who want to fly home for holidays but canâ€™t afford, or travelers stuck in emergency situations! Ever wonder what lies at the core of your favorite brand? Itâ€™s often their people, and to outline culture successfully these companies have identified their â€œculture codeâ€�. Now thereâ€™s a website where you can view these codes and apply some of their ideas to your own company! (complete with a new publication dedicated sharing learnings from growing organizations). Another personal favorite of mine and mostly just because I LOVE new ways to market and reach audiences via social media! (innovation is the key to successful strategy). Botletter lets you send your regular old email newsletter to your audience via Facebook Messenger! Without any coding, you can connect their technology to your Facebook Page. Then people can subscribe to your â€œBotletterâ€� right through Messenger. You will be able to send them messages with rich cards attached whenever you want! Performance hack anyone? 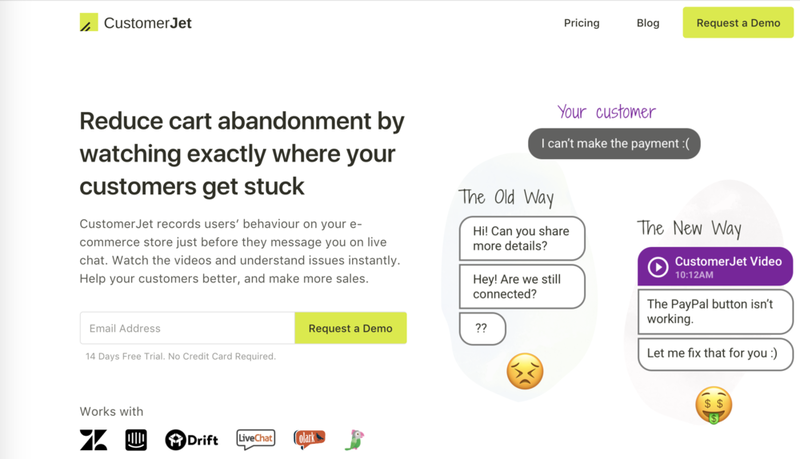 CustomerJet is a new tool for e-commerce that reduces cart abandonment on your store. It records usersâ€™ behavior on your commerce store just before they message you on live chat. You can watch the videos and understand issues instantly. CustomerJet lets you help your customers better and increase your storeâ€™s sales. I hear folks all the time tell me that writing is not their strong suit, the Boost Editor is here to save you some serious time! Boost Editor uses AI to analyze your writing for the five base emotions: joy, sadness, anger, anxiety, and disgust. After you know what emotions your writing elicits naturally, the Boost Editor will suggest word changes to optimize your writing to elicit the emotion of your choice, optimizing your content for maximum engagement! Ghostit creates your content and automatically posts to your blog, social media profiles, and sends out email newsletters because they know how much time and effort it takes. As a business professional, you have enough to do already, let alone create and maintain an online presence! Itâ€™s like your own little content marketing agency in your back pocket! This one was super exciting for me cause I JUST was saying the other day about how I need a new renters insurance provider. Quilt is for online shoppers & first-time buyers who want a simple experience that's approachable. It's easy to use - no â€œsalesyâ€� agents or overwhelming choices. And you can buy in minutes with no legalese. Renters & life insurance are first & already available across the US. More coming soon, like pet and travel insurance. Did you see something rad on Product Hunt this month? Link me up in the comments!